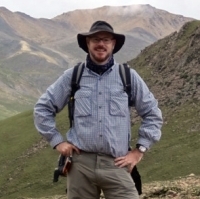 Professor with research interests in geomorphology, plant-soil interactions, arid environments, nutrient cycling, spatial modeling, and remote sensing. Professor Okin teaches courses in Physical Geography, Soils, and Remote Sensing. To contact Prof. Okin for issues related to the Department as Chair, please use: chair [at] geog [dot] ee-dee-you. To contact Prof. Okin for issues related to Research, Teaching, or Mentoring use: okin [at] geog [dot] ee-dee-you.